It’s CNA Week! 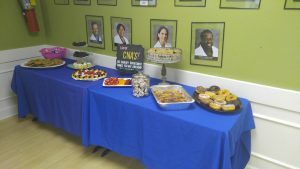 The Therapy Team truly appreciates our CNA’s and all their hard work each and every day. They have one of the toughest jobs in our facility and we know how important they are in order for the building to run. This week we wanted to show our appreciation by providing a dessert bar and personally thanking them for their hard work!